Our gorgeous 2019 fundraising calendars are now available for purchase. There are a limited quantity available at the Summerside Animal Hospital in Summerside and Blue Ribbon Pet Supply in Charlottetown. You can also contact us by email at loriburnell@eastlink.ca or jillhardy@outlook.com if you would like to purchase one but cannot get to either location. Once the calendars have sold out we will only be taking pre-paid orders. This year the sizes have changed slightly so please see the measurements above. 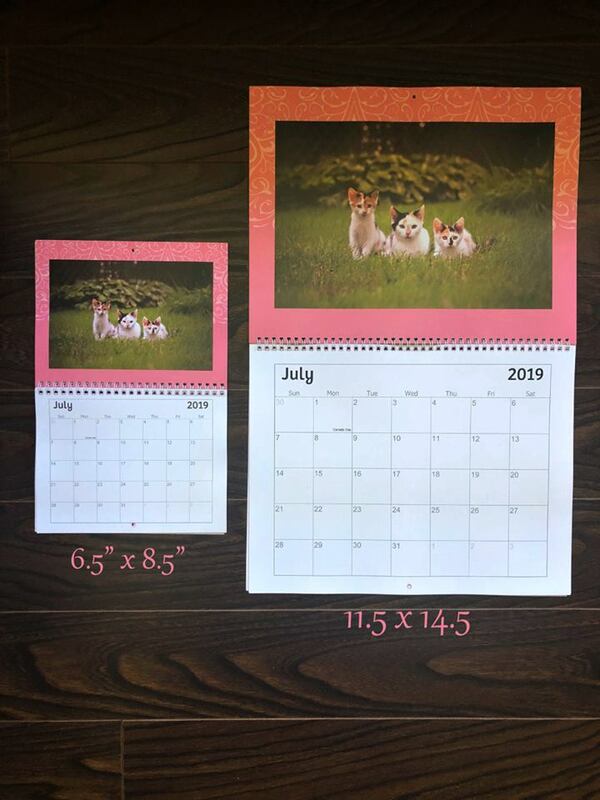 We are thrilled with how they turned out and we remind you that every kitten in the calendar was a rescue kitten from our program that may still be looking for a home or has already been adopted by an amazing family. Featured on the cover is our beautiful Penny and the “Mini Pennies” (as we like to call them – no relation to the actual Penny). 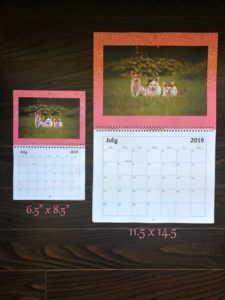 The large calendar is $25 and the mini is $20. All proceeds allow us to continue our work to rescue and rehome kittens in PEI. They also make a great Christmas gift for any cat lover on your list. A huge thank you to the very talented Jill Hardy for the photography and thanks to the Summerside Animal Hospital and Blue Ribbon Pet Supply for carrying the calendars this year. Could you please let me know when this years calendar will be ready, as I purchased one last year and I can truly say that I have enjoyed it everyday since I received; I have been anxiously awaiting the relase of this years masterpiece! Did you see the recent post about where the calendars are available this year? Are you able to drop in to one of those businesses or would you like to make other arrangements to get your calendar? I am really glad you have enjoyed last year’s calendar. I am just as proud of the 2019 version.